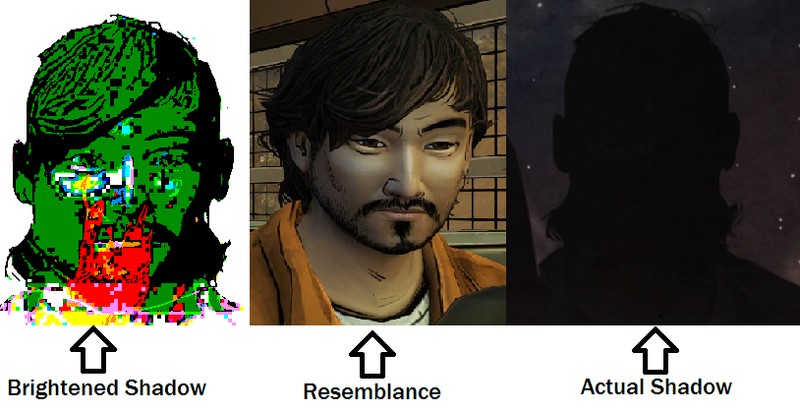 Since Clem's hair seems to look different on the slide for episode 4 for some people (as I heard). Maybe this is where that comes into play. I told her to stay away from cities and her hair is different for me. So, if you didn't tell her to keep her hair short, then maybe she won't cut it when it starts to grow o-O. P.S. Her hair does look different right? or is it just me. I just booted up my save file and Clems hair looks like that as well, even though I told her to keep it short. Oh ._. well I've see one slide where she's looking sideways and had her normal hair and I just thought it was something to do with that choice. Oh really? I did buy episode 1 on the Xbox before switching over to the PC maybe I will boot up my Xbox version tomorrow and have a look at that picture, maybe it's different for the Xbox, PS3 and PC. By any chance is your picture from the PC version? Yea, its from the PC version. Oh really? I did buy episode 1 on the Xbox before switching over to the PC maybe I will boot up my Xbox version tomorrow and have … morea look at that picture, maybe it's different for the Xbox, PS3 and PC. By any chance is your picture from the PC version? Yeah same as mine then. I will check out the Xbox picture tomorrow. Same hair, looks different because of the angle. It's either the angle or she cut it or she doesn't have her ponytail hair thing. This slide was discussed quite a while ago. It changes depending on what platform you're playing on, not what choices you made in Season 1. 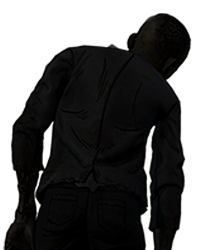 So far in Season 2 there has been no evidence that Lee's last words have any effect on the game. 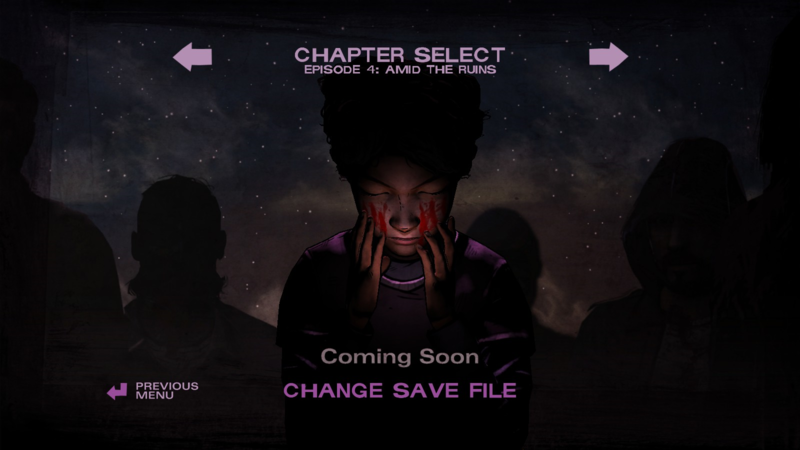 When the different Episode 4 slides were discovered shortly after Episode 1 was released, it was concluded that PC and iOS got the version you've posted, PS3 EU and Xbox 360 got a version with horizontal marks on Clem's face and the Kenny silhouette was changed to look like Vince, while PS3 US got a younger looking Clem from a different camera angle, again with the horizontal marks and the Vince-looking silhouette. 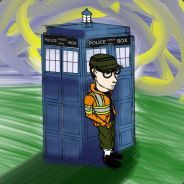 When Episode 2 released I think there were some changes to this but I haven't got any details. 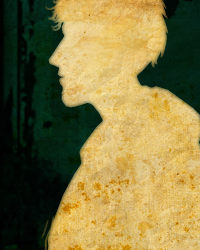 I play on PS3, and I had the Vince silhouette as well, and now it's Kenny. I don't remember which direction she was facing or the blood though, and I don't feel like looking lol. Just my personal theory, and I don't know if someone has said this before, but I took the slide as all of the people that died throughout the season, or maybe just that episode, and Clem has their blood on her hands either literally, or by association. Like how she can mention to Luke sometimes people die because of her. They were all different across platforms, now they updated it to where they are all the same. Is it me or does it look like she is kind of slyly smiling? That close up and angle of the first pic for some reason looks even creepier than the original Episode 4 slide. Does this work only for PC? 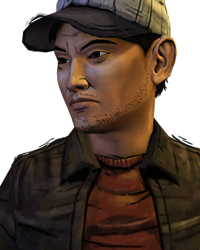 What if Telltale is screwing with us again and it's Nick in the slide and not Kenny? If you saved Nick he gets Vince killed somehow, and if Nick died Vince lives. Long hair or short hair, it's always Vince, not two separate characters. 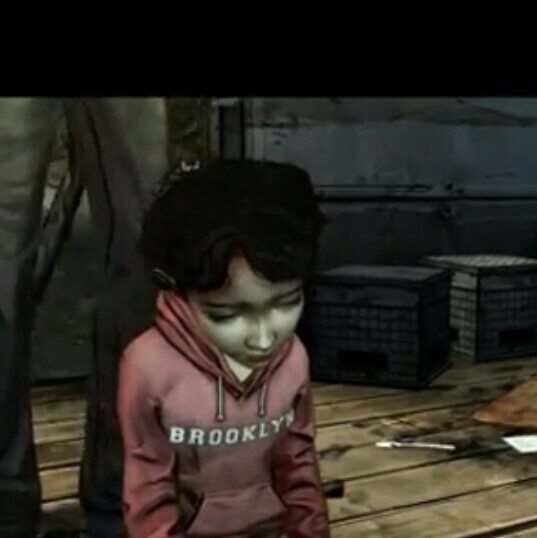 What if Telltale is screwing with us again and it's Nick in the slide and not Kenny? If you saved Nick he gets Vince killed somehow, and if Nick died Vince lives. Pretty solid theory right now, will have to let Nick die and see if the slide changes or not to confirm. Wonder why they bother to make a difference in the slide then. Vince stays at the camp = probably has less supplies = longer hair. Vince goes with Tavia = more supplies at camp = short hair. All you need to cut your hair down is a knife though, so I'm not so sure that's it. It may just have to do with here he went more so than the supplies they have. Vince stays at the camp = probably has less supplies = longer hair. Vince goes with Tavia = more supplies at camp = short hair. For the people who's episode 4 slide changed, did y'all teach Sarah to protect herself? I feel this might be what changed the pictures (probably not true) When your at Carvers camp what if a walker grabs Sarah by the back of the hair and you have a puzzle where you have to shoot the walker that's grabbing Sarah or you and Sarah both die. Clementine takes on Lees role and tells Sarah she needs to cut her hair so another walker can't grab her (Clementine doesn't do this if you don't show Sarah how to defend herself with the gun) Sarah says it looks stupid and Clementine offers Sarah the ponytails Lilly gave her which is why her hair looks different (or the angle) in episode 4, this is just a theory and I don't know about the Kenny/Vince silhouette this post is probably completely inaccurate but I just like making theories. Clem's gotta let dat hair flow. Cut or not, her hat's missing. You know, the one that her dad gave her? The one that she's been attached to since before the apocalypse? The ONLY thing she has after season 1? My point is, losing that hat would be emotional for her, and us. It represents life before the apocalypse. 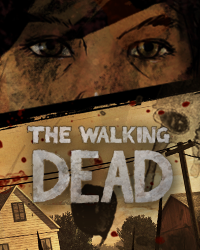 in the walking dead wiki on the amid the ruins page under trivia it says "This is the first episode with three variant title screens. The thumbnail will look different depending who went with Tavia in the "400 Days" DLC"
For the people who's episode 4 slide changed, did y'all teach Sarah to protect herself? I feel this might be what changed the pict… moreures (probably not true) When your at Carvers camp what if a walker grabs Sarah by the back of the hair and you have a puzzle where you have to shoot the walker that's grabbing Sarah or you and Sarah both die. Clementine takes on Lees role and tells Sarah she needs to cut her hair so another walker can't grab her (Clementine doesn't do this if you don't show Sarah how to defend herself with the gun) Sarah says it looks stupid and Clementine offers Sarah the ponytails Lilly gave her which is why her hair looks different (or the angle) in episode 4, this is just a theory and I don't know about the Kenny/Vince silhouette this post is probably completely inaccurate but I just like making theories. The wiki is not a reliable source of information. When Episode 1 was released we went to quite a bit of effort to figure it out. The different slides were tied to platform and region; PC and iOS got one, PS3 EU and Xbox 360 got another, and PS3 US also had another one. The differences had nothing to do with events and choices in Season 1. Now it appears in an update they have all been changed to the one in the OP (the one which originally was only on PC and iOS). 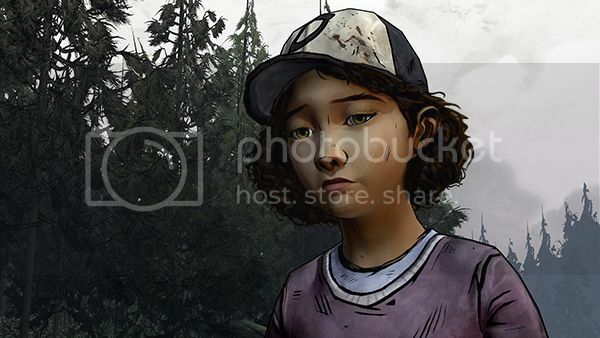 I would be gutted if Clem loses that hat the fact she isn't even in the Episode 5 slide doesn't fill me with confidence.